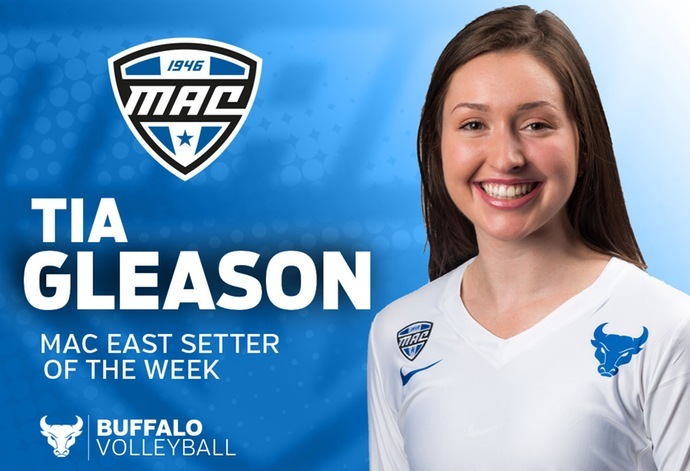 BUFFALO, N.Y. -- University at Buffalo sophomore setter Tia Gleason has been named the MAC East Setter of the Week, the Mid-American Conference announced on Monday afternoon. 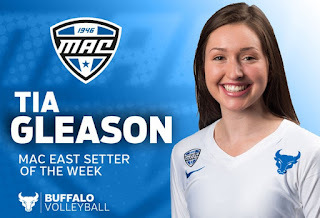 This is the third time that Gleason has earned the setter of the week honor and the sixth time it has gone to a UB setter. Gleason led the Bulls to a pair of victories this past weekend as she averaged 12.5 assists per set in 3-0 wins over Kent State and Ohio. On Friday night, Gleason had 34 assists to go along with five kills and eight digs in the victory over the Golden Flashes. She had 41 assists in a three-set win over Ohio on Saturday as she directed the Bulls to a .343 hitting mark as a team. Gleason also had a kill and two blocks in the win over the Bobcats. This marks the fourth straight week that Buffalo has earned at least one MAC weekly honor. The Bulls will close out the regular season this weekend beginning on Thursday night when they host Akron at 7pm for Senior Night. Buffalo has already clinched a berth in the upcoming MAC Tournament, but the Bulls are still looking for a bye in the tournament's opening round.